One casualty of the raging wildfire in San Bernardino County: the Summit Inn, a popular roadside diner at the crest of historic Route 66. 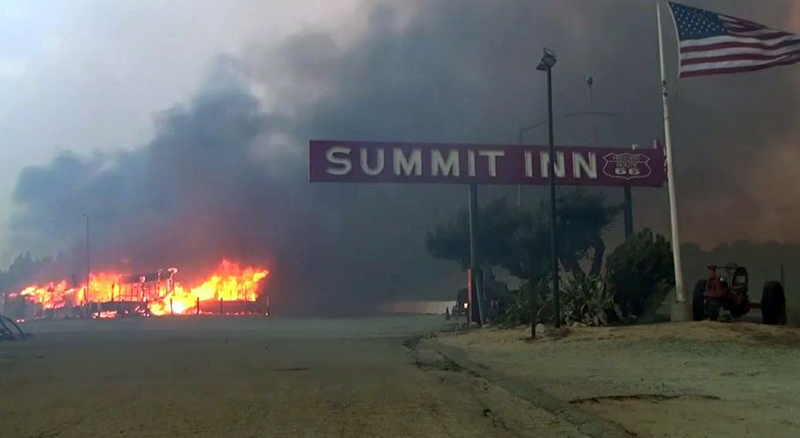 Flames from the Blue Cut fire tore through the historic inn on Tuesday, according to video footage of the inferno. After opening in 1952, the diner -- outfitted with red leather booths and walls adorned with memorabilia -- became a familiar spot for those traveling to and from the High Desert. The Summit Inn, which recently changed ownership, had touted its celebrity clientele, including Pierce Brosnan, Clint Eastwood and Elvis Presley.